Locomotive 4555 shunts wagons at Ashburton with its magnificent Brunel overall roof in the period between withdrawal of passenger services in 1958 and final closure in 1962. The building still stands and is used as a garage. October 1965 and the first two trains in the preservation era arrive at Buckfastleigh hauled by 4555 (left) and 3205. This view of Buckfastleigh station looking south from the Totnes Road bridge is today completely obliterated by the embankment of the A38 dual carriageway: a sad loss. One of the last BR trains: a pick up freight at Buckfastleigh in 1962. The day after closure and the Plymouth Railway Circle ran a ‘final’ brake van special. 4555 gingerly creeps through Staverton on the first train up the branch for three years: October 1965. Today’s South Devon Railway originally ran for nine miles from Totnes, where it joins the Plymouth to Exeter main line, to the ancient stannary town of Ashburton. There had been several schemes in the mid 1800s to link Buckfastleigh and Ashburton to the fast growing railway network. The main line from Plymouth to Exeter was being built by the original South Devon Railway. A group of local promoters came up with a plan to link Ashburton to Newton Abbot and in 1848 a Bill for a ten and a half mile branch received Royal Assent. The great Isambard Kingdom Brunel was asked to be the engineer for the line. But with the economy in recession, the plan was dropped. Eventually another scheme, also to be built to Brunel’s broad gauge of 7’01/4″, along the river Dart linking up with the South Devon Railway at Totnes was agreed upon and the line opened on 1st May 1872 as the Buckfastleigh, Totnes and South Devon Railway: the line was originally planned not to link with Ashburton. Operated by the original South Devon Railway, this company was taken over by the Great Western Railway in 1876. The line, along with all the GWR’s broad gauge lines, was converted to George Stephenson’s narrow or standard gauge (4′ 8 1⁄2″) over one weekend in May 1892, a remarkable undertaking involving a massive workforce. Brunel was an incredibly gifted engineer: had his broad gauge won the day then, today our railways would be faster and the trains would have a greater capacity. The line’s history is a quiet one and it is a sobering thought that the Ashburton branch never made a profit. Goods traffic, mainly coal, wool, cider and agricultural items, was the lifeblood of the line. Nationalisation came in 1948 and the line became part of the Western Region of British Railways. With the coming of the motor car, takings rapidly declined until 3rd November 1958 when the last passenger train ran, before even Dr. Beeching came on the scene. Freight continued until 7th September 1962. In that year, the local press revealed that a group of businessmen was planning to reopen the line as a steam operated branch line and a commercial company, the Dart Valley Light Railway Ltd, was born. On 2nd October 1965, the first rolling stock arrived: GWR locomotives 4555 and 3205 and four BR(W) auto trailers. 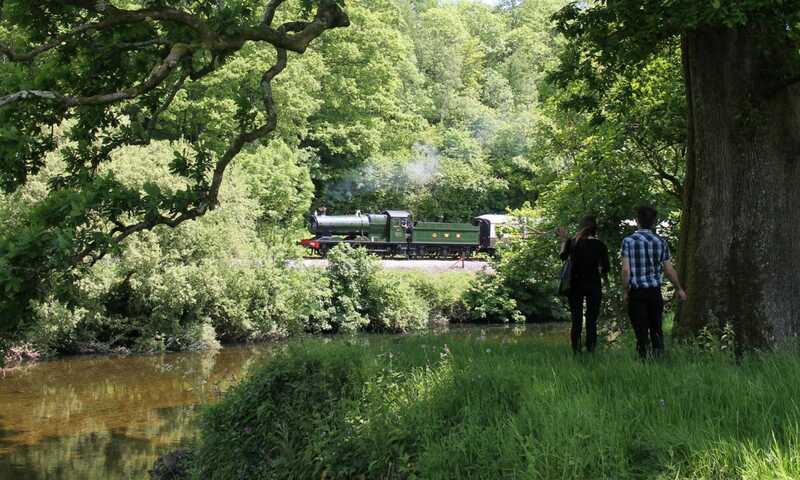 The first passenger trains ran on the Dart Valley Railway on 5th April 1969, hauled by GWR pannier tank locomotive 6412, the official opening, undertaken by no less than Dr Beeching, followed on 21st May 1969. Sadly, the last two miles of the line to Ashburton were never operated and in 1971, a year short of the line’s centenary, the line was severed to make way for the widening of the A38 and the beautiful Brunel station at Ashburton lost its trains. In 1989, the Dart Valley Railway company announced that the line was uneconomic and decided to find another operator or close it. The volunteers who had been involved with operating the line realised this was now their chance to form a company to take over the railway and run it as a registered charity. Fortunately there was a registered charity already based on the line, Dumbleton Hall Locomotive Ltd, restoring GWR No. 4920 Dumbleton Hall. Its Articles of Association allowed it to run a railway so it took over the lease of the Buckfastleigh branch on 1st January 1991. The charity was renamed the South Devon Railway Trust and the railway was renamed the South Devon Railway, the name of the first company to run trains over the line. The volunteer supporting body was similarly renamed the South Devon Railway Association. The first train under SDR operation ran on 29th March 1991 with BR(W) pannier tank locomotive 1638 and a rake of former BR coaches, all hired from the Dart Valley company. Since then the line has expanded enormously, building a loop at Staverton to enable two-train running, completing the station buildings at Totnes, expanding facilities at Buckfastleigh, carrying out major civil engineering works on the line, undertaking major resignalling works, including the re-erection of two historic GWR signal boxes, developing, rebuilding and maintaining a fleet of historic rolling stock, establishing a flourishing engineering business, launching a share issue to purchase the line and, importantly, attracting more and more visitors to come and visit us. In 2000, the SDR started negotiations to purchase the freehold of the line from the DVR for £1.15m, the money being raised through a share issue, loans, donations and revenue. In 2002, the DVR granted the SDR a 199 lease on condition of a new Transport & Works Order being granted to the SDR (a legal requirement), which would grant the final transfer of the freehold title from the DVR to the SDR for the payment of a nominal £1. In 2007, the line carried over 100,000 passengers for the first time under SDR operation and was named Heritage Railway of the Year and in 2009 celebrated the 40th anniversary of the line’s reopening. On 8th February 2010, the last step of the protracted Transport & Works Order (TWO) process was at last completed, the SDR paid the nominal £1 and became masters of their own destiny!